Hi-Rel Ferrite Chips | AEM, Inc. 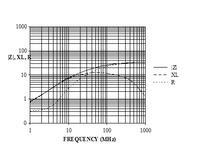 Initial AEM HRB 487070 drawing was developed to meet a market need for a hi-rel ferrite chip. DSCC 03024 drawing is the progressive step to meet increasing hi-rel Mil Spec program requirements. AEM's ferrite chips are intended for high reliability applications where replacement is not an option. All flight components are shipped with Group A & B data with optional Group C.
AEM Inc.'s Hi-Rel Ferrite Chips are classified EAR99 under the jurisdiction of the U.S. Department of Commerce. EAR99 items are eligible for export to most end users as NLR (No License Required); however, there are certain countries and end users for which a license will be required as referenced in EAR part 736. Additionally, a license may be required if the item will be used in the design, development, production, or use in nuclear, chemical, or biological weapons, or ballistic missiles.